by David Sax. Houghton Mifflin Harcourt: New York, 2009. This fall I started teaching a class on Jewish cooking for the JCC high school program. My idea for the class was that in addition to learning some fun Jewish recipes, the students and I would explore what it is that makes any one food “Jewish.” Is a food Jewish because it is mentioned in Torah or because it has specific religious significance? Is a food Jewish because it was always traditionally prepared by Jews? Where do theology, geography, and culture intersect when it comes to “Jewish food?” In addition, I wanted to discuss with them the importance of cultural memory, food, and Judaism: so many of us have strong associations with certain foods and holidays, and, perhaps even more importantly, with people (perhaps the person who lovingly made a particular dish). I think these memories and associations are fascinating and should be held sacred. As Reform rabbi and prominent theologian Eugene Borowitz once wrote, “God lurks in the chopped liver.” Meaning, I think, that behind these cultural and familial associations are very powerful ideas about God, love, family, and more. I think David Sax’s book, Save the Deli, supports this idea. Sax celebrates the history, stories, culture, and definitely the families of delis that he was alarmed to see disappearing across America. Though his book was heavily reviewed when it came out a few years ago, I just got around to reading it, in large part thinking it would be useful for this class. 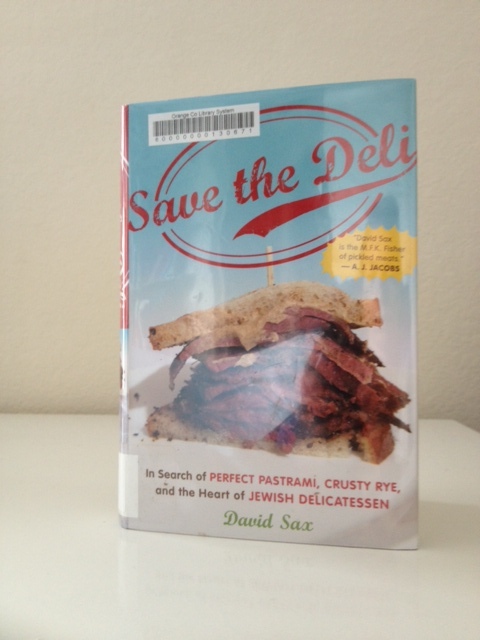 It’s a fun book, and while I’m really not a big meat eater, I definitely finished the book needing some serious rye bread, toasted, perhaps double-baked as I learned they do in the Detroit delis. Yet despite these hearty beginnings, the main theme of the book is the demise of the deli across America due to a number of factors: the rise of corporate restaurant chains, increasing rent, loss of cultural ties. (He makes sure to note that health concerns aren’t and shouldn’t really be a reason with a brief nutritional breakdown at the end). The most dismal deli scene of all seems to be in Detroit, which is a dismal scene in general these days, I guess. At Lou’s, the oldest Jewish deli in Detroit, he finds that “The counter, kitchen, and cash now sat squarely behind a wall of bulletproof Plexiglas, stretching all the way to the ceiling. The customer placed an order through a microphone, then slid money under the glass. Food was served from a bulletproof lazy Susan in the glass…” Sax notices that despite the “décor,” the place seems to be doing ok, mainly thanks to the observation from a local business consultant that “more corned beef is consumed by African Americans in Detroit for Jews for sure. Sax finds this phenomenon in the deli he visits in Kansas City, as well, where the owner tells him: “ ‘Blacks don’t have problems with eating cholesterol…if you’ve grown up eating barbecue, pastrami is a drop in the bucket.’” In celebration of this, the Kansas City deli offers a hickory-smoked brisket, which Sax deems fantastic. Speaking of cholesterol and health concerns, Sax stops in a deli in Boulder and surprised (as I would be) to find one of the best delis in the country there. It’s amazing because they are so local organic, as one would expect in Boulder – but they definitely aren’t growing any kale. “Here I was,” Sax writes,” in the mountains of Colorado, at a brand spanking new deli, and a tall blond fly fisherman was offering me a taste of the substance at the very core of Yiddish cooking” which is homemade schmaltz. Unfortunately for my family and me, Sax is perhaps most depressed about the deli scene in Florida. Miami Beach is no longer the grand refuge of retirees that it once was, as since the 1980’s, “drug violence invaded Miami and…most of the retirees living in Miami Beach survived on fixed incomes, and their frugal lifestyle negatively affected economic growth in the area, which felt like a cross between Rio’s mean streets and a shtetl by the sea.” He does note that Florida his home to the only “successful” deli chain in the country, which is Toojay’s. I’ve never been to Toojay’s. That will probably change soon. Go Gators! Beat Tennessee! 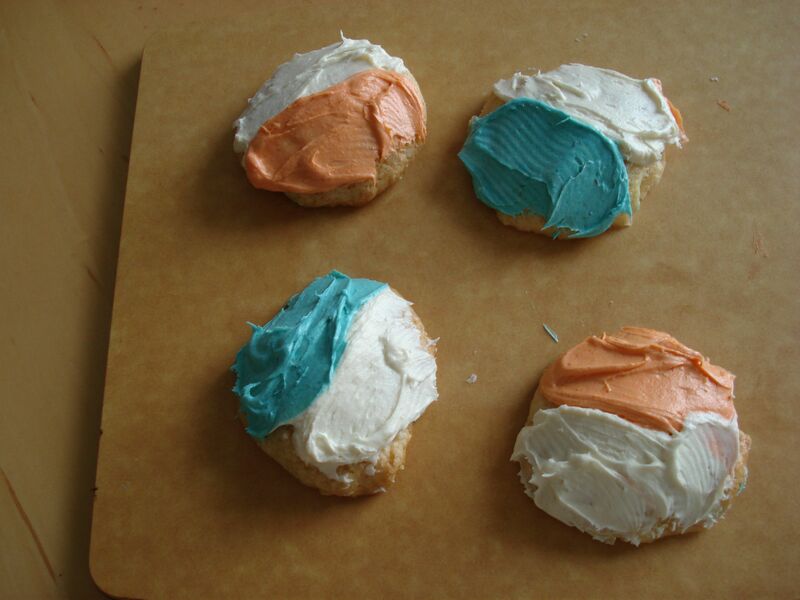 I can’t help it – they came out like that, magically.